Language instruction Apps for iPad and iPhone. 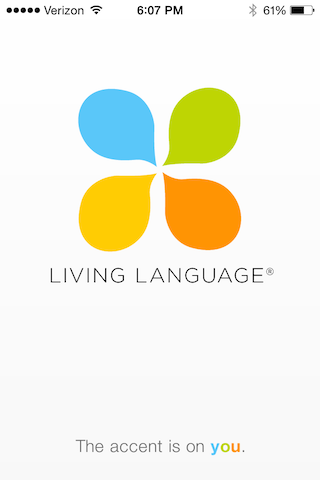 Living Language® was originally developed in 1946 for US service personnel and diplomats to become quickly conversant in a foreign language. It has since developed into a multimedia suite of courses with books, audio, web, and now mobile. Eight engaging games and activities teach and reinforce language concepts with audio, text, and animation. Intuitive navigation using Core Animation guides the user through three courses of gradually increasing difficulty. In-App purchase and web API to unlock paid content. The Spanish version debuted at #1 in the iPad Free Education category and has reached # 23 overall for iPad apps in the App Store. The French version debuted at #2 in the iPad Free Education category. The apps have been featured by Apple on several occasions. As of this writing, there has been at least one feature every week since their release. Multiple languages are currently in the top 100 grossing apps for iPad (calculated per week). End to End Architecture – in addition to coding the now universal iPhone/iPad apps, Enharmonic collaborated with the client, their designers, and their other software vendors to assist in the design of user experience as well as that of the overall architecture and data model for the digital courses on all digital platforms. Data Importer – the client’s data set for each language course is massive, containing over 80,000 lines of JSON and hundreds of megabytes of images and audio. Enharmonic provided a data importer and validator that includes data integrity checks to ensure the correct formatting of course content and assets for all digital platforms and which converts that data into a database format that the iPhone/iPad application uses for course information. This allows for very fast turn-around of editorial and other content changes. Events and User Data – the application tracks and stores game events in real time, allowing the app to aggregate the user’s progress and provide achievement feedback easily. The application also uses separate data stores for user data and content, allowing the application to be updated without any need to migrate or modify user data.